섬진강이 반달꼴로 끼고 돌며 멀리 광주 무등산까지 거침없이 바라보이는, 풍수지리상 우리나라에서 가장 아름다운 집자리 가운데 하나일 것이다. 조선 후기의 건물로 '군지촌정사'는 사랑채의 이름이며, 안채, 대문간채와 더불어 전체를 이루고 있다. 전해오는 바에 의하면 18세기 중엽에 건축되었다고 하나 안채는 19세기 초 정도에 지어진 것으로 추정된다. 안채는 '一'자형으로 서쪽부터 2칸의 부엌이 위·아래에 있으며, 그 옆에 큰방이 있는데 앞·뒤에 툇마루를 깔았다. 전면에 2칸의 대청이 있고, 뒷쪽에는 도장과 작은방이 있다. 큰방과 도장 앞은 문시설 없이 개방되었고, 작은방 앞은 문을 달아 가로막았다. 건물은 높이 쌓은 대 위에 있고, 방 앞쪽에는 큰방의 굴뚝시설로 연기가 나가는 구멍이 있다. 안채의 마당 앞에 있는 행랑채의 동쪽에 사랑채이면서, 동네사랑인 군지정사가 있다. 예전에는 이곳이 동네서당으로 쓰였다고 하며, 앞뒤로 담장이 없어서 접근하기 쉽게 하였다. 서쪽부터 사랑방이 위·아래로 있으며, 그 옆에 대청이 놓여 있는데 개방되었다. 방 앞·뒤로는 모두 마루가 깔려있다. 대문간채는 '一'자형으로 안채보다 훨씬 늦게 지었으며, 대문간을 중심으로 동쪽에 2칸 방이 있고 서쪽에는 외양간과 헛간이 있다. 집 앞 언덕 위에는 18세기에 지은 것으로 전하는 정자가 하나 있다. This house commands the most breathtaking view in Korea, overlooking Mudeungsan Mountain in Gwangju with Seomjingang River flowing around the house in a half-moon shape. Built in the late Joseon Dynasty, it consists of the sarangchae (men’s quarters) whose name is Gunjichonjeongsa as well as the anchae (women’s quarters) and daemunganchae (main gate quarters). 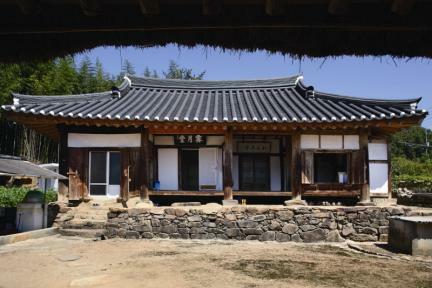 The house is presumed to have been built in the mid-18th century, but the anchae seems to have been built in the early 19th century. 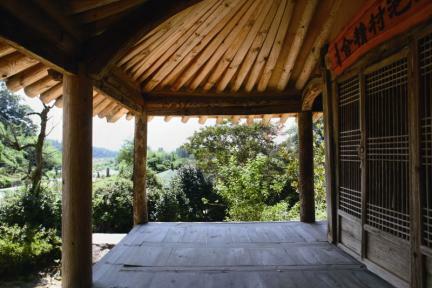 Built in a linear shape, the anchae consists of a 2-kan (a unit of measurement referring to the distance between two columns) kitchen and a master’s room with toenmaru (wood-floored veranda) on the back and front arranged from the west. 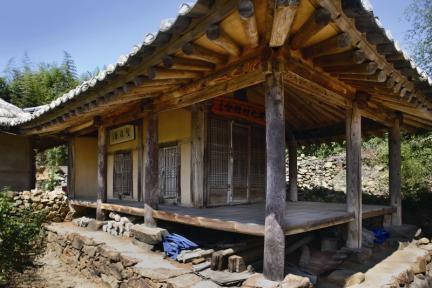 There are a 2-kan daecheong (main wooden floor) on the front side and a storage room and a small room at the back. The master’s room and storage room do not have a door, but the small room has one. The house was built on a high foundation, with a hole in front of the master’s room to let out smoke like a chimney. 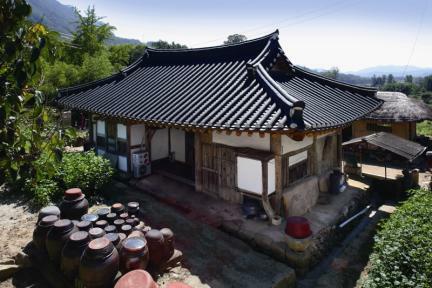 On the east side of the haengnangchae (servants’ quarters) in front of the courtyard of the anchae is Gunjijeongsa, which is said to have been used as a gathering place of the village. From the west side is the sarangbang (master's room) divided into the upper and lower sections and a wood-floored veranda in the front and back of the sarangbang. The linear-shaped daemunganchae was built much later than the anchae. Centering on the main gate are a 2-kan room on the east side and a barn and a shed on the west side. On the hill in front of the house is a pavilion built in the 18th century. ※ Viewing of the cultural property above is usually available anytime but may be limited depending on the owner’s personal circumstances.